Posted on April 1, 2016 at 4:57 pm. MURRAY — Having a parent who experienced alcohol at a young age has made 16-year-old Shaedra Pace swear off drinking, at least until she’s older. Whether parents have their own experience or not, getting involved in kids’ lives is helping to prevent underage drinking in Utah, according to health and law enforcement authorities. The numbers of kids experimenting with alcohol are going down. 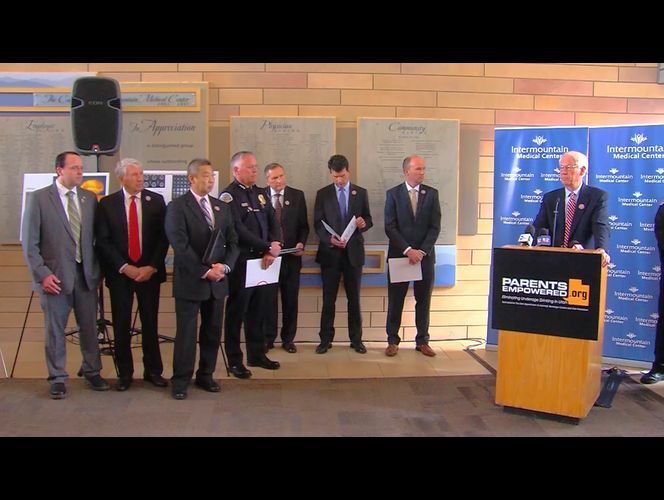 The police department, along with Murray City, the school district and Intermountain Healthcare, on Thursday announced a new partnership with ParentsEmpowered to help end underage drinking in Utah. “We understand the lifelong implications alcohol can have on a developing teen and we aim to ensure all teens grow up free from the potential devastation caused by underage drinking,” Murray Mayor Ted Eyer said during a press conference announcing the collaborative focus that coincides with National Alcohol Awareness month in April. About 19 percent of the state’s sixth-, eighth-, 10th- and 12th-graders have tried alcohol in their lifetimes, according to the student health and risk prevention survey of 2015. Alcohol remains the top substance abused by youth in Utah and binge drinking begins as early as the sixth grade, according to respondents. More than 6 percent of students in all grades surveyed reported having alcohol in the past 30 days. “We know that kids brains are developing, really, until age 26,” said Doug Thomas, director of Utah’s Division of Substance Abuse and Mental Health. He said that when a person drinks alcohol at an early age, they experience a powerful physiological response that can lead to early addiction or even alcohol poisoning, which can be fatal. In Utah, many kids now begin drinking in elementary school, and binge drinking is a common activity by the 10th grade. Most parents, however, are unaware of their child’s alcohol use. In a national survey, 31 percent of kids who said they had been drunk in the past year had parents who believed their children were non-drinkers. On average, Utah parents begin talking to their children about not drinking alcohol two years too late. Research highlighted by ParentsEmpowered shows that alcohol use at an early age disrupts proper brain development, leading to impaired thinking, learning and memory skills, as well as changes in areas of the brain responsible for judgment and reasoning and impulse control, among other consequences. Kids have a greater chance of becoming dependent on alcohol when they start drinking at a younger age than when they start at an older age, the organization, citing research, states. Addiction, Thomas said, is a chronic, relapsing disease, which can lead to lifelong problems. “Teens don’t have the mental capacity to understand the consequences associated with drinking,” he said, adding that studies have shown that kids care what their parents think. “Your attitude as parents determines more than anything else whether kids will experiment with alcohol,” said Steven Hirase, superintendent of the Murray School District. He said having difficult conversations with youth doesn’t have to be difficult for parents. Establish clear rules and expectations and maintain close involvement in a teen’s life, he said, knowing where they are and what they’re doing, as well as who they’re spending time with. Your attitude as parents determines more than anything else whether kids will experiment with alcohol. “Alcohol is certainly no ordinary commodity,” said John Nielsen, chairman of the Utah Alcoholic Beverage Control Commission. He said the health and safety of individuals and families is at stake, as well as social welfare, which ends up impacting everyone in the community. “There are things we just shouldn’t do at this age,” she said, resolved to never get involved with alcohol, but also to keep her friends and family from doing the same. “It definitely helps that I’m close with my parents,” Pace said, adding that she’d trust them over any friend. For more tips on how to talk to kids about alcohol, visit parentsempowered.org. Full Article & Video Here.